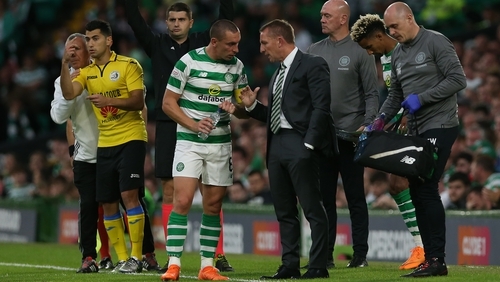 Centre half Jozo Simunovic was sent off for a high challenge on Jefferson Reis after 11 minutes of the 3-0 win over Armenian side Alashkert at Parkhead on Wednesday night which took the Hoops through 6-0 on aggregate. A first-half double from striker Moussa Dembele, the second from the spot, and a strike from James Forrest set up the tie against the Norwegian outfit with the first leg at Parkhead next Wednesday night where Simunovic will be suspended. The Scottish champions are still missing key defenders Dedryck Boyata and Mikael Lustig who have not yet returned from World Cup duty while German centre-half Marvin Compper is injured and unlikely to be fit for the first leg. Rodgers said: "Every pre-season there is always an issue with centre-halves. "Marvin was injured, it's his abductor, so we'll see how that is, but it's highly unlikely he'll be available. "I don't know (with Boyata) - I'll need to assess that over the next few days." Rodgers also hopes Dembele suffered no more than a tight leg after he was replaced by Ryan Christie in the 65th minute. He said: "He was tight at the back of his legs so we will need to assess that tomorrow and the next couple of days. Celtic won 1-0 on aggregate when the two sides met in the penultimate qualifier last season and Rodgers is expecting another tough test. He said: "They were two tight games the last time we played and we got a goal late on to get through. "They will come here and be nice and compact, like they were last year with tight lines and we will need to be patient in that game and obviously. It will be a tough game for us out there. "But it is a tie we look forward to. At this stage of the season you have to respect who you play. "And we will be another week further forward in fitness."